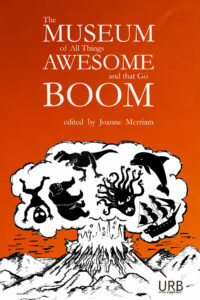 Edited by Joanne Merriam, The Museum of All Things Awesome and That Go Boom is an anthology of science fiction featuring blunt force trauma, explosions, adventure, derring-do, tigers, Martians, zombies, fanged monsters, dinosaurs (alien and domestic), ray guns, rocket ships, and anthropomorphized marshmallows. 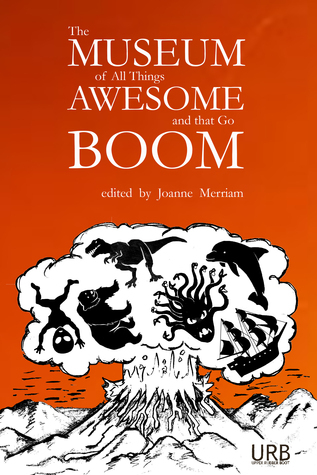 The anthology contains work by 40 authors: fiction by Jim Comer, James Dorr, Aidan Doyle, Tom Doyle, Kendra Fortmeyer, Nick Kocz, David Kopaska-Merkel, Ken Liu, Kelly Luce, Tim Major, Laurent McAllister, Sequoia Nagamatsu, Jerry Oltion, Ursula Pflug, Leonard Richardson, Erica L. Satifka, G. A. Semones, Matthew Sanborn Smith, Bonnie Jo Stufflebeam, Lucy Sussex, Mary A. Turzillo, Nick Wood, and K. Ceres Wright, and poetry by Khadija Anderson, Xochitl-Julisa Bermejo, Kristin Bock, Alicia Cole, Estíbaliz Espinosa (translated by Neil Anderson), Miriam Bird Greenberg, Benjamin Grossberg, Julie Bloss Kelsey, Katie Manning, Martha McCollough, Marc McKee, Richard King Perkins II, Christina Sng, J. J. Steinfeld, Sonya Taaffe, Deborah Walker, and Ali Znaidi. The actual Museum of All Things Awesome and that Go Boom is housed in the half-kiloSmoot-square, two-centuries-old dancing building, the Old Ptolemy, in the city of Draconis on the planet Epsilon Eridani b.
Butoh dancer, Muslim convert, and Pushcart nominated poet Khadija Anderson has been published extensively in print and online. She holds an MFA in Creative Writing from Antioch University LA and her first book of poetry History of Butoh was published in 2012 through Writ Large Press. Find her at khadijaanderson.com. Neil Anderson is a translator and teacher living in Lubbock, Texas. His translations from Galician have been published in Asymptote, The Bitter Oleander, Shearsman, Absinthe, M-Dash, and elsewhere. Xochitl-Julisa Bermejo is the 2013 Poets & Writers California Writers Exchange poetry winner. She has work published in American Poetry Review, CALYX, and Acentos Review among others. A short dramatization of her poem “Our Lady of the Water Gallons,” directed by Chicano activist and Hollywood director, Jesús Salvador Treviño can be viewed at latinopia.com. She curates the quarterly reading series HITCHED and co-founded Women Who Submit. Her debut poetry collection, Built with Safe Spaces, is forthcoming from Sundress Publications. Kristin Bock holds an MFA from the University of Massachusetts—Amherst where she currently teaches. Her poems have appeared in many literary magazines and journals, including VERSE, Columbia, Pleiades, Prairie Schooner, The Black Warrior Review, and FENCE, as well as the URB anthology Apocalypse Now: Poems & Prose from the End of Days. She lives with her husband, artist Geoffrey Kostecki, in Montague, Massachusetts where they refurbish liturgical art. She is also a contributing editor to the literary magazine, Bateau. Bock’s debut collection of poetry, Cloisters, won Tupelo Press’s First Book Award and the da Vinci Eye Award. Alicia Cole is a recent New Orleanian transplant by way of Atlanta, GA. She’s a professional writer, editor, and artist. Her sci-fi serial Blinded is currently being published by Rainbow Rumpus, and her work has recently appeared on PodCastle, and been reviewed in Dead Reckonings. You can find more of her work at www.facebook.com/AliciaColewriter and https://www.goodreads.com/author/show/6470571.Alicia_Cole. Jim Comer is an author and teacher who lives in Arkansas. Indiana writer James Dorr‘s The Tears of Isis was a 2014 Bram Stoker Award nominee for Superior Achievement in a Fiction Collection. Other books include Strange Mistresses: Tales of Wonder and Romance, Darker Loves: Tales of Mystery and Regret, and his all-poetry Vamps (A Retrospective). For more, visit Dorr’s blog at jamesdorrwriter.wordpress.com. Aidan Doyle is an Australian writer and computer programmer. He has visited more than 90 countries and his experiences include teaching English in Japan, interviewing ninjas in Bolivia and going ten-pin bowling in North Korea. Find him at aidandoyle.net and @aidan_doyle. In 2014, Tor Books published American Craftsmen, Tom Doyle‘s first novel in a three-book deal. The Left-Hand Way followed in 2015. He is a winner of the WSFA Small Press Award and a Writers of the Future Award. His short fiction has appeared in Aeon, Buzzy Mag, Daily Science Fiction, Futurismic, and the URB anthology How to Live on Other Planets: A Handbook for Aspiring Aliens. Paper Golem has published his short story collection, The Wizard of Macatawa and Other Stories. Estíbaliz Espinosa is a Spanish- and Galician-language writer, author of the books Pan (libro de ler e desler) (2000); -orama (2002); Número e (2004); zoommm. textos biónicos (2007); and Curiosidade (2015). Find her at estibalizes.wordpress.com. Kendra Fortmeyer received her MFA in fiction from UT Austin, and is the fiction editor for Broad! magazine. Her work has appeared or is forthcoming in PANK, NANO Fiction, Forge, apt, Juked, Fiddleblack (under pen name Zoe Abramson), Corium and elsewhere. Miriam Bird Greenberg is the author of the chapbooks All night in the new country and Pact-Blood, Fever Grass, and her work has been awarded fellowships from the Poetry Foundation, the Provincetown Fine Arts Work Center, and the NEA. She lives in Berkeley and teaches ESL. Benjamin S. Grossberg is Director of Creative Writing at The University of Hartford. His most recent book of poems, Space Traveler, was published by the University of Tampa Press in spring of 2014. His earlier collections include Sweet Core Orchard (University of Tampa, 2009), winner of the 2008 Tampa Review Prize and a Lambda Literary Award. Julie Bloss Kelsey writes speculative poetry and short stories from her home in suburban Maryland. Her work has been published in Scifaikuest, Seven by Twenty, Eye to the Telescope, Star*Line, and Mad Scientist Journal, among others. She is currently writing a scifaiku chapbook about an ill-fated alien romance. Visit her on Twitter @MamaJoules. Nick Kocz‘s stories and essays have appeared in Black Warrior Review, Entropy, Five Chapters, Mid-American Review, and The Nervous Breakdown. He has an MFA from Virginia Tech and is the recipient of fellowships from the MacDowell Colony and Virginia Tech. He lives in Blacksburg, VA with his wife and three children. An aether compactor by trade, David C. Kopaska-Merkel began writing poetry after witnessing the Ascension of Tim. He won the Rhysling award for best long poem in 2006 for a collaboration with Kendall Evans. He has written 23 books, of which one of the latest is SETI Hits Paydirt (Popcorn Press, 2014). Kopaska-Merkel has edited Dreams & Nightmares since 1986. Ken Liu is an author and translator of speculative fiction, as well as a lawyer and programmer. A winner of the Nebula, Hugo, and World Fantasy Awards, he has been published in The Magazine of Fantasy & Science Fiction, Asimov’s, Analog, Clarkesworld, Lightspeed, and Strange Horizons, among other places. He lives with his family near Boston, Massachusetts. Saga Press, Simon & Schuster’s new genre fiction imprint, published his debut novel, The Grace of Kings, in 2015, and will publish a collection of his short stories, The Paper Menagerie and Other Stories, in 2016. Kelly Luce‘s story collection, Three Scenarios in Which Hana Sasaki Grows a Tail, won the 2013 Foreword Review‘s Editors Choice Prize in Fiction. Her debut novel, Pull Me Under, will be published by Farrar, Straus and Giroux in 2016. A Contributing Editor for Electric Literature, she hails from Illinois and lives in Santa Cruz, California. Tim Major lives in Oxford with his wife and son. His time-travel novel, You Don’t Belong Here, will be published by Snowbooks in September 2016 and his horror novella, Carus & Mitch, was published by Omnium Gatherum in February 2015. His short stories have featured in Interzone, Perihelion, Every Day Fiction, and numerous anthologies. He is the Editor of the SF magazine, The Singularity, and also blogs at cosycatastrophes.wordpress.com. Katie Manning is the author of three poetry chapbooks, including The Gospel of the Bleeding Woman. She has received The Nassau Review Author Award for Poetry, and her writing has been published in Fairy Tale Review, New Letters, PANK, Poet Lore, and elsewhere. She is the founding Editor-in-Chief of Whale Road Review, and she is an Assistant Professor of Writing at Point Loma Nazarene University in San Diego. Find her online at katiemanningpoet.com. Laurent McAllister is the symbionym of a duo of Canadian writers, Yves Meynard and Jean-Louis Trudel. Since 1984, they have published extensively in French and in English, penning under the McAllister identity one award-winning novel, Suprématie (2009), one collection, three young adult books, and several short stories. Writing separately, they have authored nearly 40 books, and many more short stories. Tor published Meynard’s fantasy novel Chrysanthe in 2012. Trudel’s short story “The Snows of Yesteryear” was included in the John Joseph Adams anthology Loosed Upon the World from Saga in 2015. Martha McCollough is an artist and writer who lives in Chelsea, Massachusetts. Her videopoems have been exhibited at festivals and conferences internationally, and have appeared in Rattapallax, Gone Lawn, and TriQuarterly. Her poems have appeared or are forthcoming in Small Po[r]tions, Cream City Review, and Salamander. Marc McKee received an MFA from the University of Houston and a PhD from the University of Missouri at Columbia, where he lives with his wife, Camellia Cosgray. His work has appeared in several journals, among them Barn Owl Review, Boston Review, Cimarron Review, Conduit, Crazyhorse, DIAGRAM, Forklift, Ohio, LIT, and Pleiades. He is the author of the chapbook What Apocalypse?, which won the New Michigan Press/DIAGRAM 2008 Chapbook Contest, and two full-length collections, Fuse (Black Lawrence Press, 2011) and Bewilderness (Black Lawrence Press, 2014). Sequoia Nagamatsu is the author of the Japanese folklore inspired story collection, Where We Go When All We Were Is Gone (Black Lawrence Press). His work has appeared in journals such as Conjunctions, Lightspeed Magazine, Zyzzyva, The Fairy Tale Review, Tin House online, and Black Warrior Review. He is the managing editor of Psychopomp Magazine and an assistant professor of creative writing at St. Olaf College in Minnesota. More info at http://sequoianagamatsu.net. Jerry Oltion has had over 150 short stories and 15 novels published over the last 30 years, and is still hard at it. He has become the most frequently published author in the history of Analog magazine, and has won the Nebula Award for his novella, “Abandon in Place.” He is mostly known for hard science fiction with a human, often humorous touch. Richard King Perkins II is a state-sponsored advocate for residents in long-term care facilities. He has a wife, Vickie and a daughter, Sage. He is a three-time Pushcart nominee and a Best of the Net nominee whose work has appeared or is forthcoming in hundreds of publications including Bluestem, December Magazine, Emrys Journal, Poetry Salzburg Review, Roanoke Review, Sierra Nevada Review, The Louisiana Review, The Red Cedar Review, The William and Mary Review, and Two Thirds North. Ursula Pflug is the critically acclaimed author of the novels Green Music (Edge/Tesseract), The Alphabet Stones (Blue Denim) and Motion Sickness (Inanna; illustrated by S.K. Dyment). She penned the story collections After the Fires (Tightrope) and Harvesting the Moon (PS). She edited the anthologies They Have To Take You In (Hidden Brook) and Playground of Lost Toys (Exile; with Colleen Anderson.) A YA novella, Mountain, is forthcoming from Inanna. She teaches creative writing workshops at Loyalist College, Trent University (with Derek Newman-Stille) and elsewhere. She has collaborated with filmmakers, dancers, and installation artists and her short fiction has been taught at universities in Canada and India. Find her at ursulapflug.ca. Leonard Richardson became a programmer because paleontology involved too much outdoor work. He writes prose and open source software from his home in New York. For more about him, go to www.crummy.com. Erica L. Satifka‘s fiction has appeared in Daily Science Fiction, Clarkesworld, and Shimmer as well as URB’s anthology How to Live on Other Planets. Weaned on fairy tales and hero adventures, G. A. Semones remembers reading his first space opera when about nine years old. He began writing in his teens and writes primarily fantasy and science fiction. He is a Liberty Hall Writers denizen. A software engineer, he has built scary things that self-heal and self-organize. He is a devoted husband, dad and granddad who, when not writing, enjoys history, antique cryptography, fossils, reading, and gardening with his wife. His work has appeared on The Drabblecast, Ray Gun Revival, and Alternate Hilarities, among others. Matthew Sanborn Smith is a South Floridian speculative fiction author whose fiction has appeared at Tor.com, Nature, Chizine, and Diabolical Plots among others. He is an occasional contributor to the StarShipSofa, SF Signal, and SFF Audio podcasts. His collection, The Dritty Doesen: Some of the Least Reasonable Stories of Matthew Sanborn Smith, is waiting patiently for just the right reader, and his podcast, Beware the Hairy Mango, is adored by dozens. Christina Sng is a Rhysling-nominated poet, writer, and artist. Her work has received several Honorable Mentions in the Year’s Best Fantasy and Horror. She is the author of three chapbooks and her first full-length book of poetry, A Collection of Nightmares from Raw Dog Screaming Press arrives late 2016. Visit her online at christinasng.com. Canadian J. J. Steinfeld lives on Prince Edward Island, where he is patiently waiting for Godot’s arrival and a phone call from Kafka. While waiting, he has published sixteen books, including the short story collections Disturbing Identities (Ekstasis Editions), Should the Word Hell Be Capitalized? (Gaspereau Press), Would You Hide Me? (Gaspereau Press), A Glass Shard and Memory (Recliner Books), and Madhouses in Heaven, Castles in Hell (Ekstasis Editions), the novels Our Hero in the Cradle of Confederation (Pottersfield Press) and Word Burials (Crossing Chaos Enigmatic Ink), and the poetry collections An Affection for Precipices (Serengeti Press), Misshapenness (Ekstasis Editions), and Identity Dreams and Memory Sounds (Ekstasis Editions). His short stories and poems have appeared in numerous anthologies and periodicals internationally, and over forty of his one-act plays and a handful of full-length plays have been performed in Canada and the United States. Bonnie Jo Stufflebeam lives in Texas with her partner and two literarily-named cats: Gimli and Don Quixote. Her work has appeared in magazines such as Clarkesworld, Lightspeed, Strange Horizons, and Interzone. She holds an MFA in Creative Writing from the University of Southern Maine’s Stonecoast program and curates an annual Art & Words Show, profiled in Poets & Writers. Bonnie is represented by Ann Collette at Rees Literary. You can visit her on Twitter @BonnieJoStuffle or through her website: www.bonniejostufflebeam.com. Lucy Sussex was born in New Zealand. She has edited four anthologies, including She’s Fantastical (1995), shortlisted for the World Fantasy Award. Her award-winning fiction includes books for younger readers and the novel The Scarlet Rider. She has five short story collections, My Lady Tongue, A Tour Guide in Utopia, Absolute Uncertainty, Matilda Told Such Dreadful Lies (a best of), and Thief of Lives. Her latest project is Blockbuster! : Fergus Hume and the Mystery of a Hansom Cab. Sonya Taaffe‘s short fiction and poetry can be found in the collections Ghost Signs (Aqueduct Press), A Mayse-Bikhl (Papaveria Press), Postcards from the Province of Hyphens (Prime Books), and Singing Innocence and Experience (Prime Books), and in various anthologies including The Humanity of Monsters, Genius Loci: Tales of the Spirit of Place, and Dreams from the Witch House: Female Voices of Lovecraftian Horror. She is currently senior poetry editor at Strange Horizons; she holds master’s degrees in Classics from Brandeis and Yale and once named a Kuiper belt object. She lives in Somerville with her husband and two cats. Mary Turzillo‘s 1999 Nebula-winner, “Mars Is no Place for Children” and Analog novel An Old-Fashioned Martian Girl are recommended reading on the International Space Station. Her poetry collection Lovers & Killers won the 2013 Elgin Award for Best Collection, and she has been a finalist on the British SFA, Pushcart, Stoker, Dwarf Stars and Rhysling ballots. Sweet Poison, her collaboration with Marge Simon, came out from Dark Renaissance in 2014. She lives in Berea, Ohio, with her scientist-writer husband, Geoffrey A. Landis. Deborah Walker grew up in the most English town in the country, but she soon high-tailed it down to London, where she now lives with her partner, Chris, and her two young children. Find Deborah in the British Museum trawling the past for future inspiration or on her blog, deborahwalkersbibliography.blogspot.com. Her poems have appeared in Dreams & Nightmares, Star*Line, and Enchanted Conversation. Nick Wood is a South African clinical psychologist, with around twenty short stories previously published in Interzone, Infinity Plus, AfroSF, PostScripts, Redstone Science Fiction, Fierce Family, and How to Live On Other Planets, amongst others. His YA speculative fiction novella The stone chameleon was published in South Africa and his debut novel Azanian Bridges is due to be published in the UK in 2016 by NewCon Press. He has completed an MA in Creative Writing (SF & Fantasy) through Middlesex University, London and is currently training clinical psychologists in London, England. He can be found at @nick45wood or nickwood.frogwrite.co.nz. K. Ceres Wright received her Master’s degree in Writing Popular Fiction from Seton Hill University in Greensburg, PA, and Cog was her thesis novel for the program. Wright’s science fiction poem, “Doomed,” was a nominee for the Rhysling Award, the Science Fiction Poetry Association’s highest honor. Her work has appeared in Diner Stories, Hazard Yet Forward, Genesis: An Anthology of Black Science Fiction, The 2008 Rhysling Anthology, Far Worlds, The Dark God’s Gift, and Many Genres, One Craft. Find her at www.kcereswright.com or on Twitter @KCeresWright. Ali Znaidi lives in Redeyef, Tunisia, where he teaches English. He authored four poetry chapbooks including Experimental Ruminations (Fowlpox Press, 2012), Moon’s Cloth Embroidered with Poems (Origami Poems Project, 2012), Bye, Donna Summer! (Fowlpox Press, 2014), and Taste of the Edge (Kind of a Hurricane Press, 2014). You can see more of his work on his blog at aliznaidi.blogspot.com. Joanne Merriam is the owner and publisher of Upper Rubber Boot Books. She was born in Halifax, Nova Scotia, Canada and lived thereabouts for her first three decades. In 2001, she quit her job as the Executive Assistant of the Writers’ Federation of Nova Scotia to travel Canada by train, and then parts of the Northeastern and Southern United States. Her first book of poetry, The Glaze from Breaking, was written, in part, about those travels. In 2004, she immigrated to the USA, where she has lived in Kentucky and New Hampshire, and now resides in Nashville, Tennessee. Joanne Merriam’s poetry and fiction has appeared in dozens of magazines and journals, including The Antigonish Review, Asimov’s Science Fiction, The Fiddlehead, The Furnace Review, Grain, The Magazine of Speculative Poetry, The Mainichi Daily News, Per Contra, Riddle Fence, Room of One’s Own, Strange Horizons and Vallum Contemporary Poetry, as well as in the anthologies Ice: new writing on hockey, To Find Us: Words and Images of Halifax and The Allotment: New Lyric Poets. 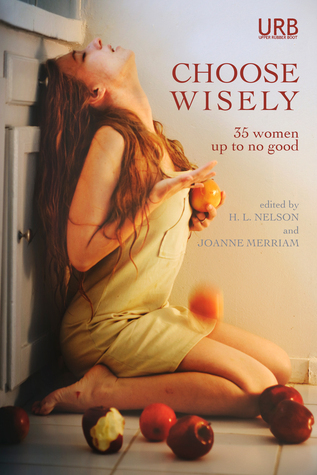 She most recently edited How to Live on Other Planets: A Handbook for Aspiring Aliens and co-edited Choose Wisely: 35 Women Up To No Good with H. L. Nelson. Visit her at www.joannemerriam.com. Giveaway ends August 23, 2016. Giveaway ends July 31, 2016.